This man is 19 3/4 inches with nice bone. Moves nicely, beautiful foot timing. Throws drive but biddably in his offspring. Although he does have grand champion points, we are no longer showing the man. 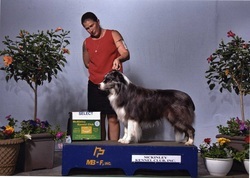 We have several of his pups in our upcoming breeding program. Ted had been retired and is living the good life on the farm. His favorite thing to do is to go for ice cream. Next is hanging out in the water...watching the stock. He is a true farm dog at heart.